Download "CHAPTER 67.2 RESIDENTIAL BUILDING CODE"
3 8. 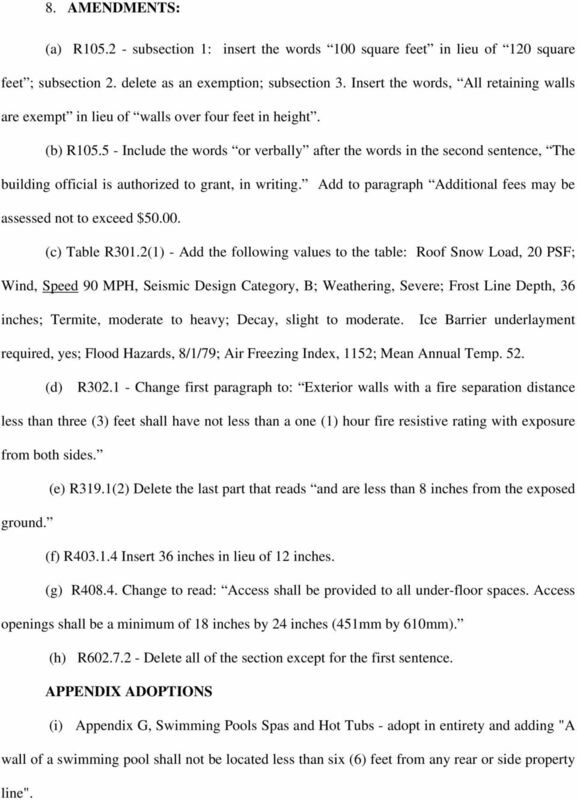 AMENDMENTS: (a) R subsection 1: insert the words 100 square feet in lieu of 120 square feet ; subsection 2. delete as an exemption; subsection 3. Insert the words, All retaining walls are exempt in lieu of walls over four feet in height. (b) R Include the words or verbally after the words in the second sentence, The building official is authorized to grant, in writing. Add to paragraph Additional fees may be assessed not to exceed $ (c) Table R301.2(1) - Add the following values to the table: Roof Snow Load, 20 PSF; Wind, Speed 90 MPH, Seismic Design Category, B; Weathering, Severe; Frost Line Depth, 36 inches; Termite, moderate to heavy; Decay, slight to moderate. Ice Barrier underlayment required, yes; Flood Hazards, 8/1/79; Air Freezing Index, 1152; Mean Annual Temp. 52. (d) R Change first paragraph to: Exterior walls with a fire separation distance less than three (3) feet shall have not less than a one (1) hour fire resistive rating with exposure from both sides. (e) R319.1(2) Delete the last part that reads and are less than 8 inches from the exposed ground. (f) R Insert 36 inches in lieu of 12 inches. (g) R Change to read: Access shall be provided to all under-floor spaces. Access openings shall be a minimum of 18 inches by 24 inches (451mm by 610mm). (h) R Delete all of the section except for the first sentence. APPENDIX ADOPTIONS (i) Appendix G, Swimming Pools Spas and Hot Tubs - adopt in entirety and adding "A wall of a swimming pool shall not be located less than six (6) feet from any rear or side property line". 5 Mechanical: Furnace or air conditioning unit or equipment replacement, or installation Electrical wiring for new/add on furnace or air Conditioning Plumbing $25 per unit $25 per unit $6 per fixture with a minimum of $25 per unit (d) For permits to alter or repair other than one and two family residential structures or residential accessory buildings, the amount shall be per work value as listed in item (a) above. (e) For permits to erect or construct new buildings or additions to buildings other than one or two family residential or residential accessory buildings, the amount shall be per work value as listed in item (a) above. 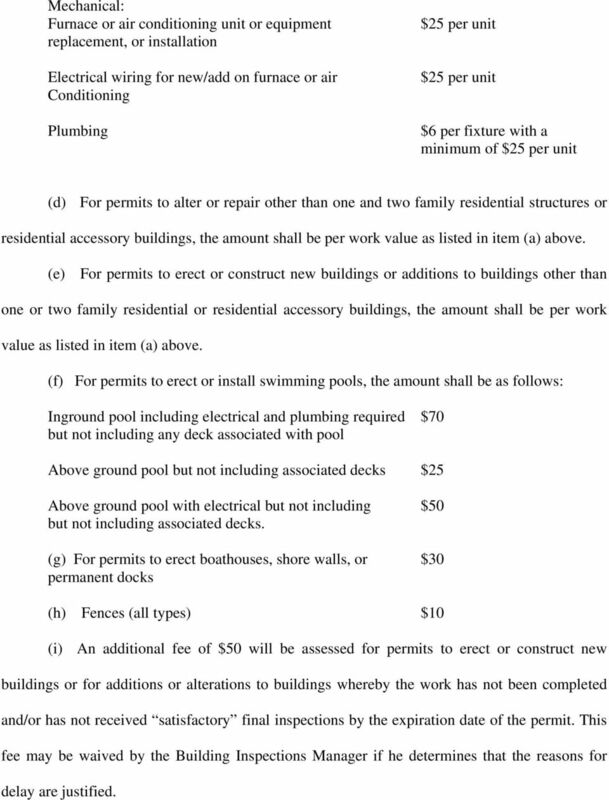 (f) For permits to erect or install swimming pools, the amount shall be as follows: Inground pool including electrical and plumbing required $70 but not including any deck associated with pool Above ground pool but not including associated decks $25 Above ground pool with electrical but not including $50 but not including associated decks. (g) For permits to erect boathouses, shore walls, or $30 permanent docks (h) Fences (all types) $10 (i) An additional fee of $50 will be assessed for permits to erect or construct new buildings or for additions or alterations to buildings whereby the work has not been completed and/or has not received satisfactory final inspections by the expiration date of the permit. 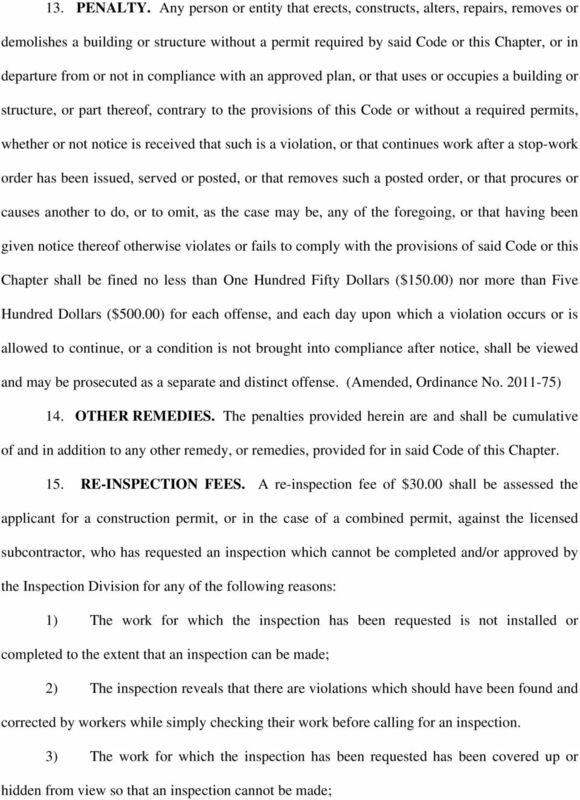 This fee may be waived by the Building Inspections Manager if he determines that the reasons for delay are justified. 6 11. WORK DONE WITHOUT PERMIT. Should any work for which a permit is required be commenced or be done before such permit is issued and obtained, the required permit may nonetheless be issued for such and subsequent work; however, the amount of the required fee as provided herein for all work, both that commenced before and that proposed to be done after said permit is issued, shall be double that otherwise so provided, and issuance of such permit shall not, and shall not be, and shall not be construed to be, an excuse from, or waiver of, or defense to or absolution from any penalty, liability or action otherwise provided for in said Code or this Chapter but shall be cumulative of and in addition thereto. 12. RISK OF INJURY. Whenever application for a permit indicates that a part of a public way or other property of the City will be used for storage of material, or be closed, or otherwise used appurtenant to the work to be done under such permit, or application is made for a permit to move a building or structure, or application is made for a permit to demolish a building or structure other than one not exceeding 20 feet high above grade and with a minimum separation from the nearest other existing structure of five feet and the nearest property line of a public way of not less than ten feet, if by reason of the size, condition, or location thereof it appears to the building official there will exist the possibility or risk of injury to persons or property, such official may withhold such permit unless there is on file with the Finance Department an enforceable contract of insurance, with the person or the entity that is to perform the work and the City as named insured, affording coverage for each occurrence of personal injury of not less than $500,000 and for property damage of not less than $100,000 and expressly provided that the same remain in effect for the term thereof absent written notice of cancellation received by said Clerk, in which event said permit shall automatically terminate to the same extent as if the same had been physically withdrawn and canceled. 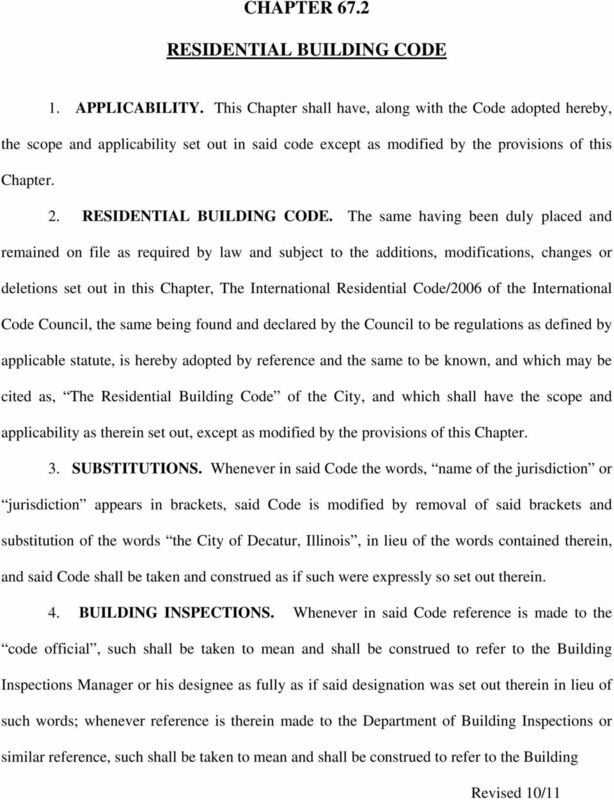 9 (a) Failure to arrange for inspections required under Chapters 67, 67.2, 68, 69, and/or 70.1 of the City Code within a reasonable time frame. (b) Failure to take reasonable requested action to uncover work which requires inspection but has been hidden from view of the inspector. (c) (d) (e) Failure to pay required permit or re-inspection fees. Failure to obtain a building permit for work which required a building permit. Failure to take reasonable action to notify and obtain approval from division of changes made to approved building permits. (f) (g) (h) Falsifying information on building permit applications. Performance of building permit work under an invalid or voided building permit. Failure to obtain a required Certificate of Occupancy before occupying or allowing occupancy of new construction or change in use. Permit applicants from which permits are to be withheld must be notified by mailing notice of same to the permit applicant or license subcontractor by certified mail, return receipt requested. 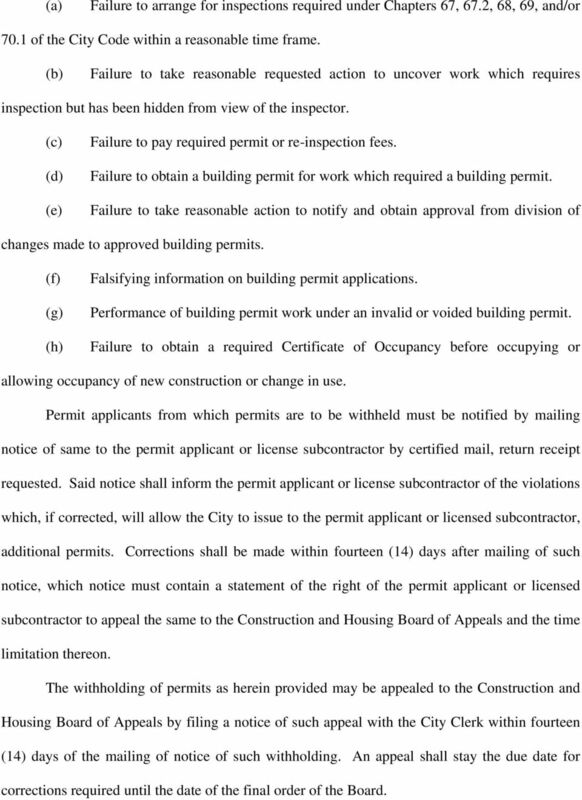 Said notice shall inform the permit applicant or license subcontractor of the violations which, if corrected, will allow the City to issue to the permit applicant or licensed subcontractor, additional permits. 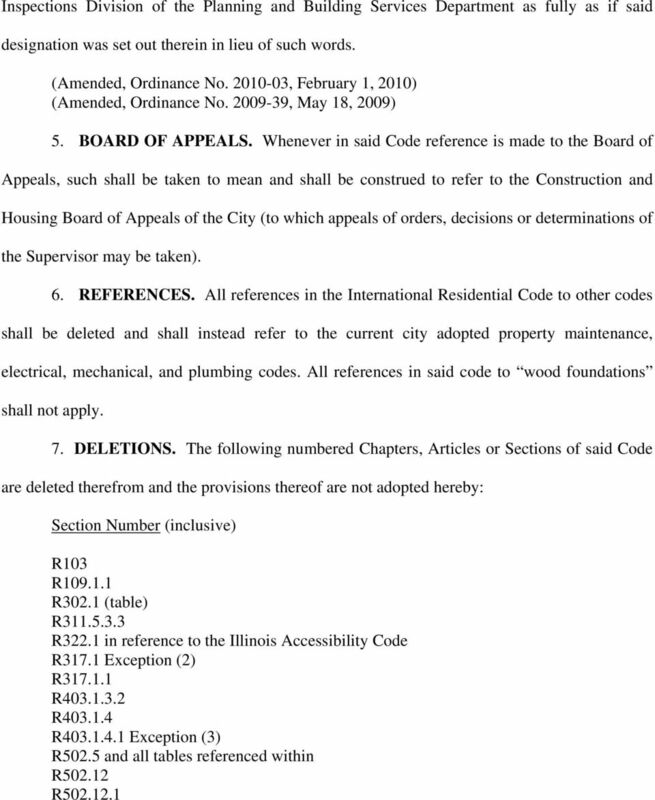 Corrections shall be made within fourteen (14) days after mailing of such notice, which notice must contain a statement of the right of the permit applicant or licensed subcontractor to appeal the same to the Construction and Housing Board of Appeals and the time limitation thereon. 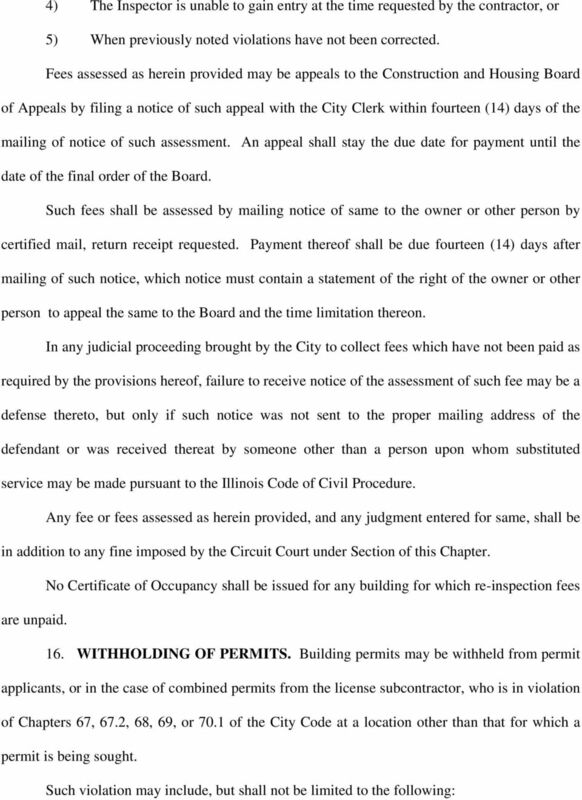 The withholding of permits as herein provided may be appealed to the Construction and Housing Board of Appeals by filing a notice of such appeal with the City Clerk within fourteen (14) days of the mailing of notice of such withholding. An appeal shall stay the due date for corrections required until the date of the final order of the Board. 10 17. SEVERABILITY. The provisions hereof are, and shall be construed to be severable, and invalidity of any section or provision of this Chapter of or the codes and standards hereby adopted shall not invalidate other sections or provisions hereof. 18. REPEALED. That existing provisions of ordinances not in conformity with the provisions of this Chapter are, to the extent of such nonconformity, amended, modified or repealed so as to conform with the provisions hereof. New Jersey Department of Community Affairs Division of Codes and Standards Landlord-Tenant Information Service LANDLORD IDENTITY LAW N.J.S.A. 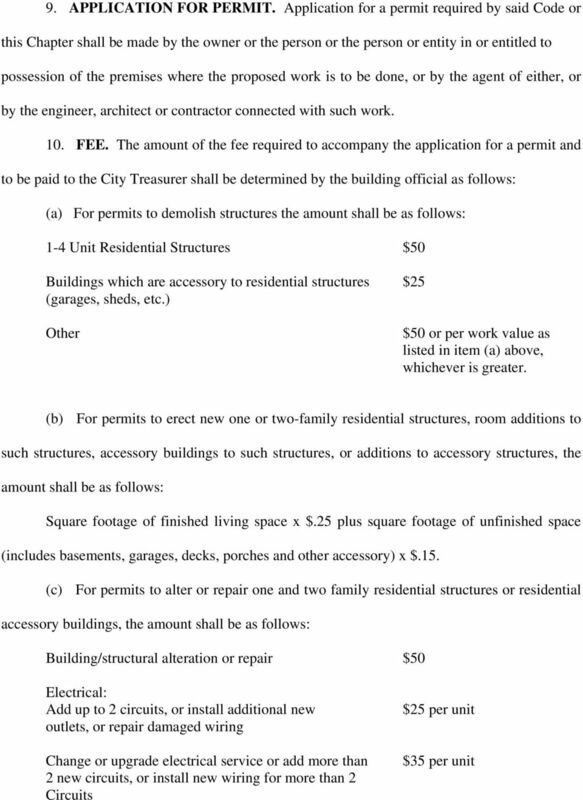 46:8-27 through 46:8-37 46:8-27 Landlord, project defined. 17 East Main Street Cuba,NewYork 14727 www.cubany.org 585-968-1560 Code Enforcement Useful Information Office Information What is zoning? When Do I Need a Building Permit? When are Permits Not Required? SECTION 105 PERMITS. 2. Fences not over 6 feet (1829 mm) high. 3. Oil derricks. Sec. 4-31. Alarm permits. Sec. 4-32. Duties of the alarm user. Sec. 4-33. Duties of the alarm company. Sec. 4-34. User fees; false alarms. Sec. 4-35. Appeals. Sec. 4-36. Awareness class. Sec. 4-37. Penalty. 48A ARTICLE 330 Landlord and Rental 330.01 Purpose: licensing residential rental units. 330.02 Definitions. 330.03 Residential rental unit registration required. 330.04 Residential rental license required. 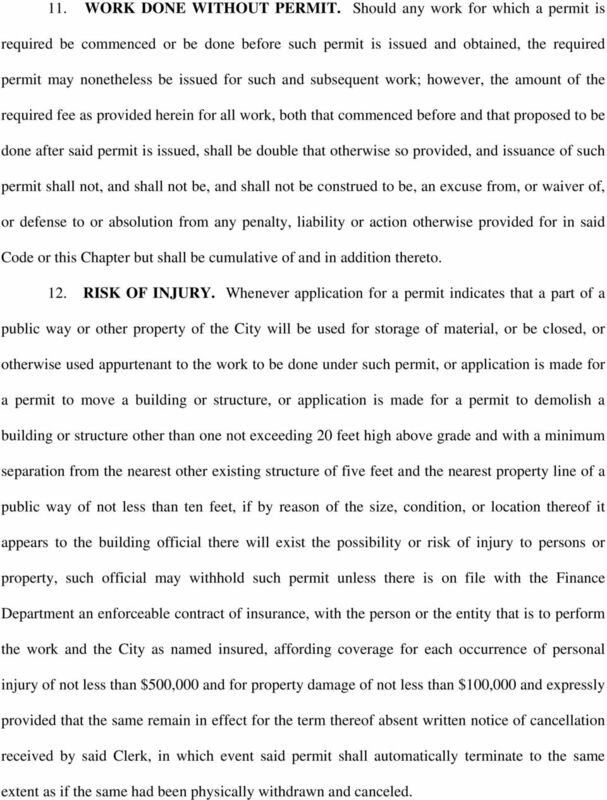 Construction and Demolition Ordinance Declaration of Purpose Definitions Covered and Non-Covered Projects. FREQUENTLY ASKED QUESTIONS: 1) Q: When is a building permit required? REQUIREMENTS FOR OBTAINING A THORNBURY TOWNSHIP, DELAWARE COUNTY PERMIT ATTACHED ARE THE REQUIREMENTS FOR OBTAINING A BUILDING PERMIT INCOMPLETE SUBMISSIONS WILL BE RETURNED IN THEIR ENTIRETY -- NO EXCEPTIONS! !